One of the things I really enjoy about Sweden is the access to wild meats. 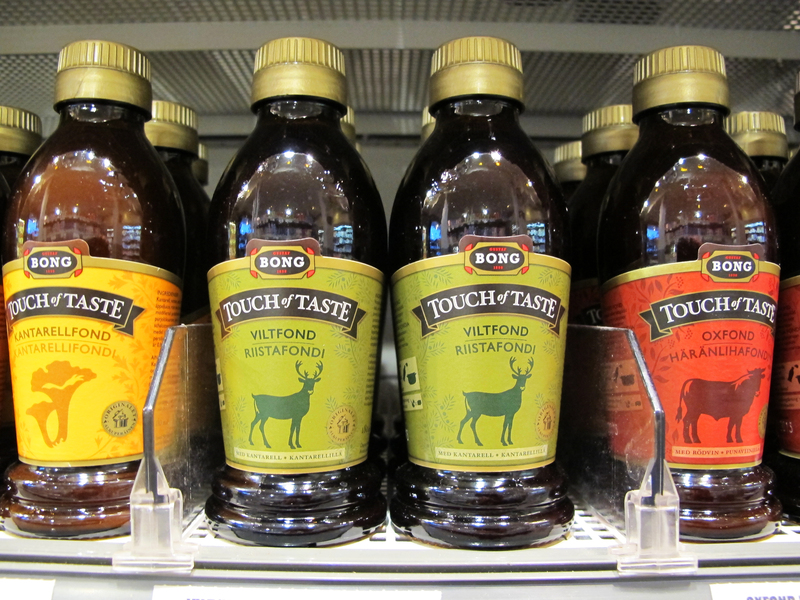 Moose, wild boar, reindeer, and venison are readily available in supermarkets. The cost is generally comparable to beef and you can get wild meats ground or in the form of roasts. I don’t have a lot of experience with wild game, but when its not extraordinarily priced it’s fun to experiment with it and expand my horizons. 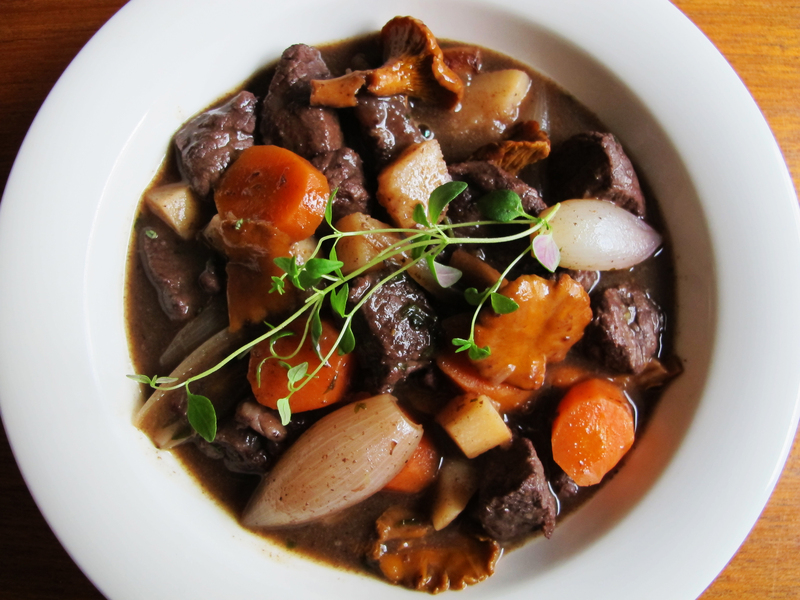 Gryta (GREE-tuh), or stew, is common fall and winter fare in Sweden as in many regions with cold winters. But the fun part of making stew here is including the wild meats and chanterelles that can be hunted in the Swedish forests. Another interesting ingredient I hadn’t used before is parsley root. Although rare in the U.S. it is a common root vegetable in central European cuisine. It looks like a white parsnip and has a somewhat dry texture with a kind of celery, parsley-like taste that is overall very intriguing. If you can’t find it, celeraic, parsnips, turnips or carrots are good substitutes. An ingredient that I love here are the fonds. They are essentially concentrated liquid stock flavors that can be used in the place of bullion cubes. In this recipe I used the viltfond (wild stock). It also comes in chanterelle, beef, veal, lobster, shellfish, fish, chicken, and vegetable. I will really miss these if I ever move away. In my efforts to experiment a bit more with moose (I was not keen on the ground patties I made last week) I bought a moose roast and perused some classic Swedish gryta recipes. I took the parts I liked the best from the recipes and combined them with the simplest preparation. I love the combination of the tastes of the forest between the moose meat, chanterelle and juniper berries. The result is an earthy, wild, comforting stew that goes well with mashed potatoes, rice, or wide egg noodles. 1. Combine the ingredients for the marinade. Place the moose meat in a sealable plastic bag and pour the marinade over it. Set the bag in the refrigerator and marinate for 8-12 hours. 2. Remove the meat from the marinade, pat dry, and cut into bite-sized cubes. Discard the marinade. Heat the olive oil in a large pot over medium high heat. Quickly brown the meat, working in small batches and placing batches aside if necessary to avoid crowding the pan. 3. Once the meat is browned, place it all back into the pot. 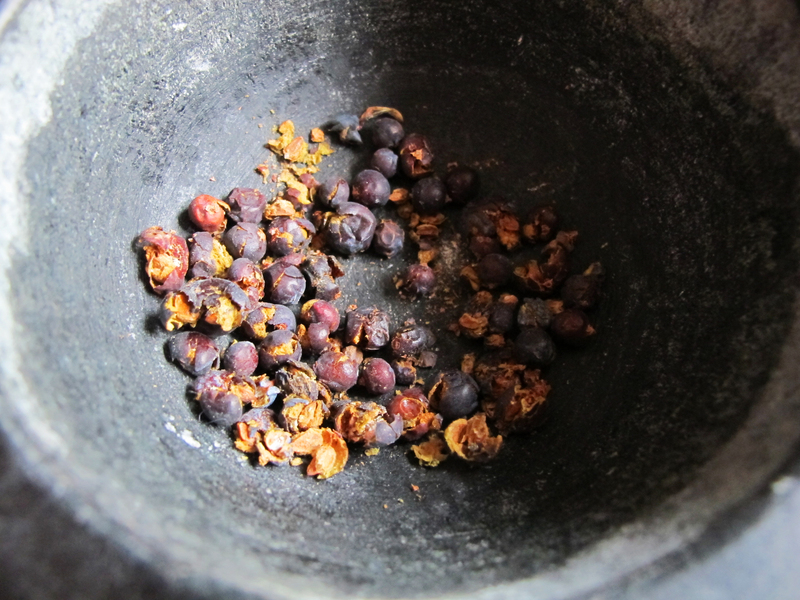 Add the red wine, viltfond (or bullion cubes), juniper berries and water to the pot. Mix the flour with just enough water to make a smooth slurry. Add it to the pot. Cook everything at a gentle simmer for 20-30 minutes until the meat is nearly done. 4. While the stew is cooking, heat half of the butter in a frying pan and saute the carrots, parsley root, and shallots over medium-high heat until crisp-tender. Add to the stew during the final 10 minutes or so of cooking. 5. Add the remaining butter to the same frying pan used for the other vegetables and cook the chanterelles until they begin to soften. Add them to the pot in the last five minutes of cooking along with the fresh thyme. 6. Serve the stew hot either with mashed potatoes, rice, or wide egg noodles. This sounds utterly fabulous! I love braised meats. The addition of chanterelles reminds me of Polish cooking (my mother is Polish). How long to cook moose meat before it’s tender? I imagine at least four hours? Since the meat was cut into small cubes it didn’t take long to cook. I actually over cooked it with 45 minutes. It would have been much better medium rare so I reduced the cooking times in the recipe. You could also pound it with a meat mallet to soften it up, then marinate it. Even though the meat was drier than I would have liked, we still really enjoyed the dish. And the leftovers were yuuuummmy. I tried reindeer in Finland–it is funny to think of these. I was told that in northern Finland they also sell bear? That’s a bit far for me I think, though I think Pa was hunting bears in Little House on the Prairie. I draw the line at “bear”. I first encountered them in the Great Smoky Mountains of Tennessee and North Carolina, and later in the Adirondacks of New York. Bears are very intelligent beings, and not malicious unless provoked or attacked. During my countless backpacking trips in these areas, I came to understands that I was in their home, and that I should respect that. If they outsmarted me and took my food from a tree hang, one for the bears. Stick to your principles on this one. I am an American living now in Helsingborg since 2009. After wandering in the mountains in the very north of Sweden, and enjoying “all man’s rights” to walk the land, pick the berries and mushrooms, I decided it was time to cook a real moose stew. I found your recipe during a web search. I have two comments/suggestions. First, with 3.5 cups of red wine and water, I found the resultant “soup” a bit runny. Or, did I not add enough flour? Thoughts for a more substantive base? Second, while the recipe calls for 3 tablespoons of fresh chopped thyme, it does not say what to do with it. The image suggest using a whole sprig as a garnish during serving. Did I miss something? On the whole, a great recipe. Thanks! My husband is from Helsingborg and his mother is still there so we make it up there quite often. It’s a very nice city. I hope you are enjoying it. Where in the U.S. are you from? I am guessing from the bear comment it might be Tennesse? In terms of thickening the stew, of course you can always add more flour or cornstarch. I actually made it today with 3 tablespoons of cornstarch and it had a very nice consistency. But stew is kind of a personal thing and some like it thicker than others. I’m kind of a middle-of-the-road gal. And thank you for the point about the time. Sorry about that. I will add it to the directions. If you are using fresh thyme, add it at the end with the mushrooms. If you use dried, add it with the vegetables. And word to the wise….DON’T try to use this recipe with älggryt kött. It comes out completely inedible. Thanks for taking the time to comment, and I’m glad you enjoyed the recipe. My wife was born in Göteborg, but moved to Brazil with her family when she was three years old. She moved to the U.S. when she was thirteen, yet remained a swedish citizen throughout. We met in the District of Columbia, and we have been married now for more than 44 years. We agreed some years ago that when we retired we would live somewhere in Europe, as we both love Europe and its incredible diversity. Sweden turned out to be a good option, and so here we are. We live in the old part of Maria Park in northern Helsingborg, from which it is easy to plane, train or drive just about anywhere in the world. I grew up in Alabama, so your guess about Tennessee is close. I lived my adult life in either the District of Columbia or in Wilton, Connecticut, about one hour from New York City. I have worked all over the world. I see that you added the thyme near the end. That was my choice when I made the first stew, so thanks for the update. Some last notes: I made this first stew following the full recipe. Since my wife is traveling in the U.S. for one month just now, I had leftovers. Storing and reserving yields an unattractive and dull purple sameness. To retain the freshness and colors of the first pot, and for a thicker base, here is what I did on the second recipe. First, I reduced the wine to 1 1/2 cups. Second, I added a bit more flour, which gave me the thicker base I was seeking. Third, and most important to me, I kept the major portions separate, blending only enough for the meal that I was about to eat. This meant refrigerating the stew base and carrot-parsley root-shallot blend separately, and combining them just before the follow-on serving. This meant also cooking the chanterelles for each serving, but no big deal. The results were the same for each meal – a fresh, tasty, earthy multi-colored feast right off the land.